What It’s About: When three London kids are evacuated to the countryside home of Miss Price (Angela Lansbury), an aspiring witch who hopes to use her magic to help the war effort, they find themselves in a world of flying beds, animated suits of armor, and islands inhabited by human hating talking animals. Why Watch it Today? : The Nazis invaded the Channel Islands today in 1940. Bedknobs and Broomsticks, in part, suggests that the reason they never got further was that their scouting forces were turned aside by Miss Price’s magic. 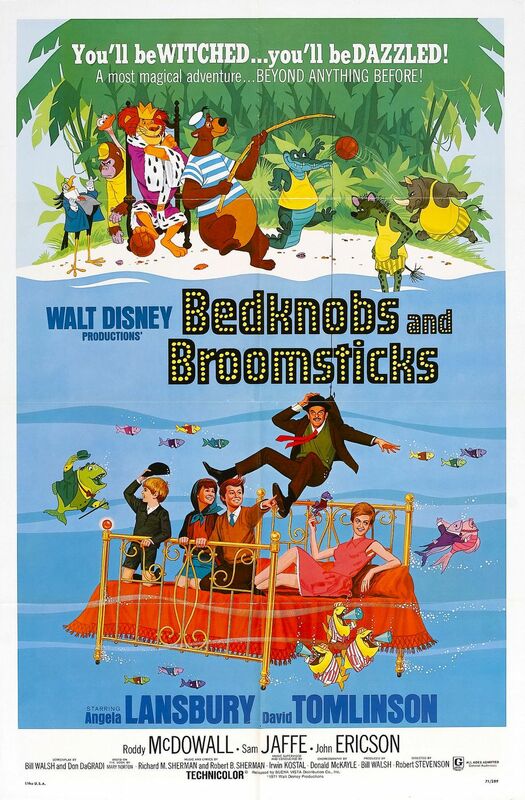 Bedknobs and Broomsticks was Disney’s attempt to follow-up their success with Mary Poppins by adapting another English children’s book series into a big budget musical with sequences combining live actors and animated footage, but Disney trimmed a half hour of footage from the released film and it was not as successful as its predecessor. This being said, in many ways it is more fun for kids (or at least young boys), with some vicious talking animals, warfare between Nazis and suits of armor, more magic, and an encounter with some London hoods. Did I mention it features suits of armor animated by magic repelling Nazi invaders? Can you figure out which sequence I loved the most as a kid? This entry was posted in Animation, Based on a Book, Comedy, Event Film, Family, Fantasy, Movie of the Day, Musical, Slapstick and tagged Angela Lansbury, animated inanimate objects, annoying children, anthropomorphic animals, armor, Best Art Direction Set Decoration Nominee, Best Costume Design Nominee, Best Music Nominee, Best Song Nominee, Best Special Effects, Britain, con artist, David Tomlinson, Disney, Hank Worden, homeguard, live action combined with animation, magic, magician, Nazis, Roddy McDowall, Sam Jaffe, The Blitz, witch, World War Two.